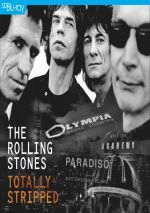 Totally Stripped is a newly-revised version of the documentary that was originally made to coincide with the release of The Rolling Stones' Stripped album released in November 1995. Back in 1994-95, the Rolling Stones embarked on a massive world tour to support their new Voodoo Lounge album. Most of these shows played stadiums, and an abbreviated version of one of those concerts came via the Voodoo Lounge Live DVD. 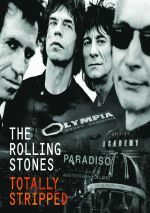 In a twist, however, the Stones played a handful of 1995 dates at small venues in Amsterdam, Paris and London. These became the basis of an “unplugged” live album called Stripped. Fast-forward 20 years and this endeavor receives a new video release entitled Totally Stripped. With performances from all three of the shows mentioned – as well as studio sessions - we find a 17-song setlist with tracks from various parts of the band’s career. “Not Fade Away” dates all the way back to their 1964 debut, and “The Spider and the Fly” stems from 1965’s Out of Our Heads. 1968 delivers the single “Jumpin’ Jack Flash”, while 1969 provides the single “Honky Tonk Women” as well as Let It Bleed’s “Love In Vain”, “Let It Bleed” and “Gimme Shelter”. From 1971’s Sticky Fingers, we hear “Dead Flowers” and “Wild Horses”, and 1972’s Exile on Main Street brings “Tumbling Dice” and “Shine a Light”. 1978’s Some Girls boasts “Faraway Eyes”. The Stones play two songs from the then-current Voodoo Lounge: “I Go Wild” and “You Got Me Rockin’”. Finally, we find covers of Willie Dixon’s “Down in the Bottom”, Bob Dylan’s “Like a Rolling Stone” and the Temptations’ “I Can’t Get Next To You”. Though one might expect Totally Stripped to offer a straight concert compilation, it leans in the direction of “documentary” at times. That means we hear comments from Stones Mick Jagger, Keith Richards and Ron Wood as well as producer Don Was, keyboardist Chuck Leavell, bassist Darryl Jones, engineer Ed Cherney, lighting director Dave Hill, set designer Mark Fisher and saxophonist Bobby Keys. The first four performances come from studio sessions and not the stage. “Love In Vain”, “Spider”, “Wild Horses” and “Let It Bleed” are all “live in the studio” and not in front of a crowd. (Or they’re presented as “live in the studio” – I won’t claim no overdubs/re-recording occurred.) “Tumbling Dice” also shows a backstage “warm-up” version, and “I Can’t Get Next to You” comes from a rehearsal. To be honest, I was never a big fan of the “unplugged” theme that blossomed in the early 90s. I like to rock, so quieter versions of songs don’t tend to appeal to me. I appreciated the original Stripped album mainly because it included versions of some semi-obscure songs, but I can’t say I loved the performances themselves. 20 years later and my attitude hasn’t really changed, though only so much “stripping” affects the songs. Plenty of them – “Gimme Shelter”, “Jumpin’ Jack Flash”, etc. - sound very similar to the “plugged” versions you’d hear at a “regular” concert. For every song with an acoustic bent, we get others that rock. Which is fine with me, though the format leaves me less than excited. As mentioned earlier, Totally Stripped leans more toward “documentary” than “concert video”, and that leads to some frustrations. I don’t mind the interview segments, though I don’t know how much they add, as I’m not sure we learn a whole lot about the project. The participants throw out occasional thoughts but these fail to present much insight, and various “behind the scenes” shots add little as well. We find plenty of movements with fans that go nowhere and the whole thing starts to feel puffy and promotional rather than revealing and insightful. This also means that we don’t get a lot of uninterrupted performances. Some songs – like “Gimme Shelter” – are just excerpts, and many others come with interview clips played over the music. That turns into an annoying choice. I find myself especially bothered by the emphasis on non-concert elements because the band played so well in 1994-95. Mick sounded simply great, and though they could still be rough at times, the Stones put on mainly terrific performances that tour. I’ve seen the Stones dozens of times and 1994-95 remains my favorite expedition; they simply came together better on that tour than on the others I’ve viewed. If you want full performances, you need to pursue an expensive deluxe Totally Stripped that includes all three of the small 1995 concerts. The “basic documentary” feels like a tease and a compromise. I enjoy parts of it but find myself frustrated by it in the end. Rolling Stones: Totally Stripped appears in an aspect ratio of approximately 1.33:1 on this Blu-Ray Disc. Taken from a standard-def source, the result came with more than a few inevitable warts. Definition became a problem. Close-ups offered acceptable delineation, and some two-shots looked decent, but anything wider turned mushy and soft. Quite a few instances of jaggies and shimmering occurred, but I saw no problems with source flaws, as the material lacked any video interference or related issues. Colors lacked heft. Tones tended to look heavy and without much range. Blacks were decent, and low-light shots appeared murky. The image looked about the way I expected given the limitations of mid-1990s video. As for the program’s DTS-HD MA 5.1 soundtrack, it worked better, though it also came with ups and downs. In the studio, the soundscape focused on music, of course, and it used the five speakers to spread out instrumentation. Live segments did the same, though I thought those sons concentrated on the front speakers to a higher degree. They still blended with the surrounds to a moderate degree, but the back channels usually focused on ambience and crowd noise. These choices seemed appropriate. Audio quality was mostly good. Some vocals showed too much reverb, but usually these elements seemed fairly natural and well-reproduced. Instruments offered positive accuracy and warmth, though low-end response could’ve been better. Overall, the soundtrack seemed fine but not great. Note that the Blu-ray also came with a standard LPCM stereo track. Obviously it lacked the surround elements, but it boasted superior sound quality – mainly because Mick’s vocals lacked the moderate reverb of the 5.1 mix. No extras appear on the Blu-ray itself, but the package includes a bonus CD. It mixes versions found in the documentary with some not heard there. In the latter category, we find performances of “Shine a Light”, “Like a Rolling Stone”, “Rip This Joint”, “Honky Tonk Women”, “Brown Sugar”, “Miss You” and “Midnight Rambler”. The presence of songs not found at all in the documentary – or done at different venues – makes the CD more valuable. That said, I’d have liked it even more if it included only performances not found on the Blu-ray. I do appreciate that it differs from the Stripped album that came out in 1995, though. We also find a booklet. This piece offers photos, credits and production notes. It acts as a decent complement to the set. As a concert film, the Rolling Stones’ Totally Stripped disappoints, as it comes with too much material that distracts from performances. As a documentary, it also doesn’t fare especially well because it fails to offer much insight. The Blu-ray offers dated visuals along with generally good audio and a useful bonus CD. Totally Stripped brings some good moments but seems less than stellar overall.